The mailman says everybody has them now. I went over to my neighbor’s and they have one. We recently got one. Now that I know what they look like I’m seeing them everywhere. It’s the Ring Doorbell and you have probably been recorded by one. After putzing around for months trying to figure out which security camera(s) to choose, our decision would ultimately be made by Santa: Ring Doorbell Pro. Ours has been online for less than a month and I’m a believer. The doorbell camera is noticeable during the day and even moreso at night with the nightvision bulbs. This deters foul play at all hours. The fisheye lens provides great detail in any light and you can customize the detection area so that your motion sensors are only triggered exactly where you want them – I am impressed with how well this feature works. You need an existing, hard-wired, classic doorbell. You simply replace your existing button with the Ring. Anytime someone enters the motion detection area you’ve set up, or anytime someone rings the doorbell, your cameras are rolling and you are notified via text message. You can hear and speak with anyone at your door anytime from anywhere using a smartphone app. There are two of us using ours, one on an iPhone and one on a Pixel, and we’ve both had a good experience so far. Footage is available in realtime and also stored for viewing later. 30 days of surveillance backups are included for only a few dollars per month as of this writing in early 2018. There is also a social aspect included with your subscription. 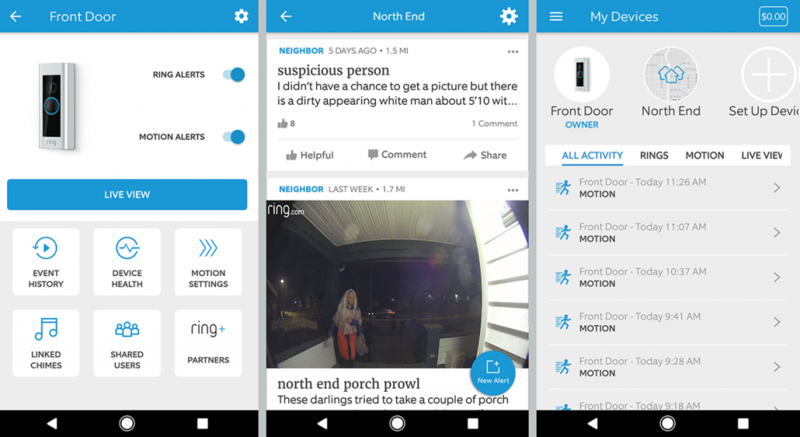 Our north end neighborhood has its own Ring community where people are sharing and discussing footage of suspicious activity captured on their doorbell cameras. NOTE: To make your new button ring your old doorbell chimes, you need to physically wire in a small box (included) to the old chimes. This process took me less than 15 minutes and I am not a qualified electrician. All doorbell wiring is low voltage so you are not at risk of electric shock during installation. To put your mind at ease, you can shut off the power before installing, but it’s not necessary. Feel free to email me specific questions about the installation and use of the Ring.